When is the last time you used every hour of your vacation time? If you’re like the majority of Americans, by the time a work year is over, you’ve left part of your earned time off on the table. Even worse? Over 60 percent of Americans also work—while they are on vacation. Many people think that if they take time off or completely disconnect, work will suffer too much. But what’s actually suffering is more personal than that. Not only are you forfeiting the dollar value of your benefits, but you’re less likely to receive either a bonus or promotion—that’s right, less likely. Then there are the less-easy-to-quantify reasons to take all that vacation. Research has shown that you’re happier both before and after a vacation, and you’re also likely to be less stressed. Although worries about mountains of work abound, vacations are actually proven to be helpful to productivity. 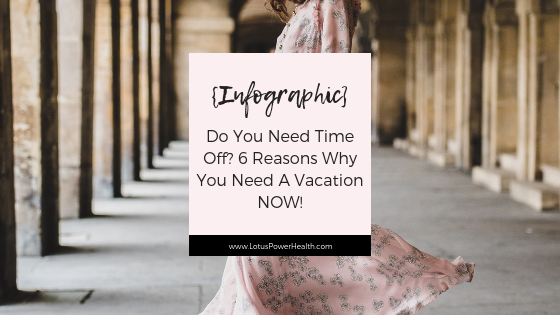 Want to learn more about why vacations are good for you? Use this graphic for help. How many days/weeks of holidays do you have a year? When are you planning to take them? Feel free to share that with us if you’d like to! If you’re familiar with The Optimised Health Formula, then you know that Step 1 of successfully pulling out a strategy to optimise your health is to shift your mindset. We’ve looked at a few things you can do to improve your health. The ball is in your court. Yes, we all know that it takes more than just knowing what to do to actually do it. Revise your expectations bearing in mind your goals AND your life. Not everything that I’ve shared in this blog post will resonate with you. Not everything will be applicable to you either. And that’s alright! But you’ve got to start somewhere. So, as long as you’re clear on your goals and on your vision (Step 2 of The Optimised Health Formula), take a conscious decision of what you want to apply starting from today. That’s where carving out time, and making a plan comes in. You know yourself at that stage better than I do. 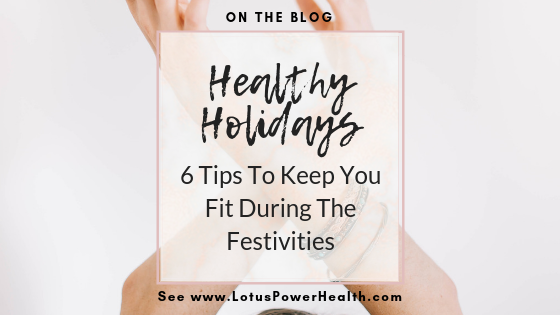 Use that knowledge to implement a plan of action that will help you start making positive changes into your life, that will soon bring positive changes in your health. There’s no tomorrow in success. Any successful path starts today, with a small change that you keep on building onto. Commit to starting today with ONE small thing, and share with me in the comments what it is. This commitment will help you start – and keep – taking action! We tend to want to do things on our own. I’m not stranger to that either. But I’ve learnt over time, and I’ve seen both with my personal coaching clients and professional mentoring clients, as well as with myself, that getting support helps to really create the change we’re after. So, if you’re stuck wondering what’s next, and you know you need help, I invite you to check out the many online resources I have created to help you reach your best of health: free articles, online community, online books and courses. If you’d like private personal coaching guidance, you can also book a call with me to discuss the personal coaching options that are available for your special needs. Note: if you’re a professional and you’re interested in getting your clients the results they’re after, I invite you to check out our sister website for professional mentoring AudreySArnold.com.